Benoit Rolland in his home shop examines the strings on one of his new bows that includes his new frog piece. 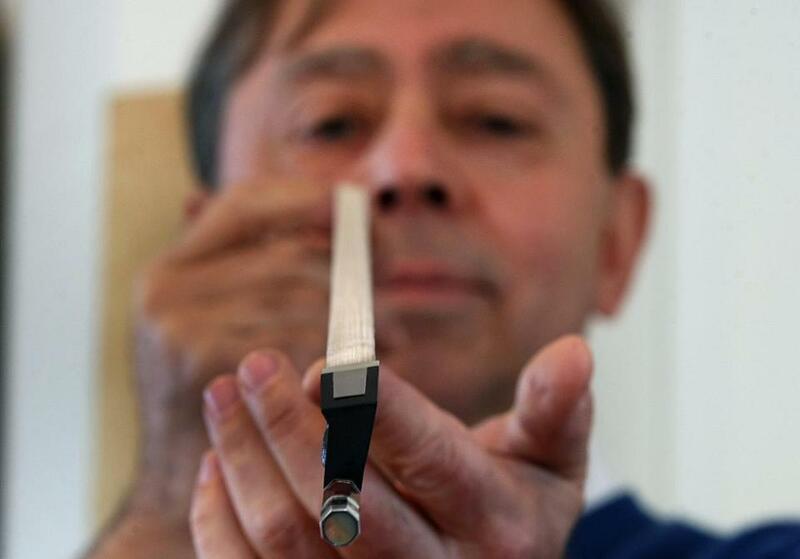 For his entire professional life, Benoît Rolland has been making bows for stringed instruments with one goal: making music easier to play. This fall, Rolland, who lives in Watertown with his wife, was rewarded for his innovations and artistry over a career that has included making about 1,800 bows. He was named one of 23 MacArthur Foundation fellows, and given an unrestricted grant of $500,000. Rolland said he expects the award will allow him to work at a less frantic pace, and give him more time for his inventions. He also hopes to finish a book about his work. Over the years Rolland has made bows for some of the world’s most famous musicians, including violinists Yehudi Menuhin and Anne-Sophie Mutter. 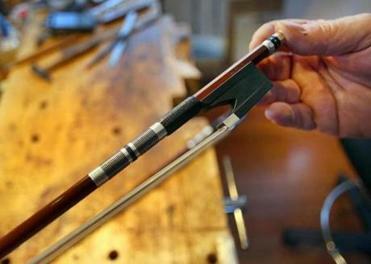 Kim Kashkashian, a violist who teaches at New England Conservatory, has asked Rolland to make two bows for her. “He actually will listen to you play and watch you play and instinctively understand the style of your playing, the particular sensuality of your bow and string relationship,” said Kashkashian, also a leader with the local Music for Food program. When Rolland meets with musicians who would like one of his bows, he spends more time listening to them perform than talking with them. “Some of us use the string like a sculpting tool and some of us use it like a paintbrush. And he feels those things,” Kashkashian said. Rolland grew up in Paris as the grandson of a famous pianist, who taught him to play. When he was 9, he wanted to switch instruments and fell in love with the violin. Two years later, he made his decision — he would become a professional violinist. Rolland practiced endlessly, and graduated from the Conservatoire de Paris and Versailles. But when he was 16, he saw a wooden bow so beautiful — with tortoiseshell, 18-karat gold, pearls — that he never forgot it. Benoit Rolland in his home shop with one of his new bows that includes his new frog piece, in the foreground, and the old-style one behind it. Until then, Rolland had not known that bows were made separately from violins, by skilled craftsmen. After he graduated from the conservatory, he enrolled in the only bow-making school in the world, in Mirecourt, France, led by the famous Bernard Ouchard. Rolland studied there for four years, and returned to Paris to open his own studio. He worked 12 hours a day and won awards for his craftsmanship. But city life was fast paced and stressful, with people calling him all day. So he moved to Bréhat, an island off the coast of Brittany. The island was populated by fishermen, and by some families so poor they lived inside stables with dirt floors. Here, Rolland learned how to sail. He bought an old boat made of plywood and rebuilt it, eventually traveling to Spain, Ireland, and England. Through the world of boats, he learned about composite materials. In 1988, ready to return to the French mainland, he moved first to Normandy, then Brittany, where he became a pioneer in creating bows made of carbon fiber. The synthetic material provided an alternative to pernambuco, a Brazilian wood traditionally used for bows that is becoming scarce. Rolland continued to make wooden bows as well. In 2000, he moved to Salt Lake City, where he continued making bows and created a bow-making workshop. There, he met his future wife, Christine Arveil, who was giving a lecture on violin varnishes. Arveil, a painter and writer, is also French, and she and Rolland discovered they had mutual friends, and had attended some of the same concerts in Paris. They moved to Boston in 2001, a month after the Sept. 11 attacks. Eighteen months ago, they moved to a house on a quiet street in Watertown, with room for Rolland’s workshop and a garage they transformed into a studio for Arveil. The MacArthur call came on a September morning, as Rolland was meeting with his intellectual property lawyer. 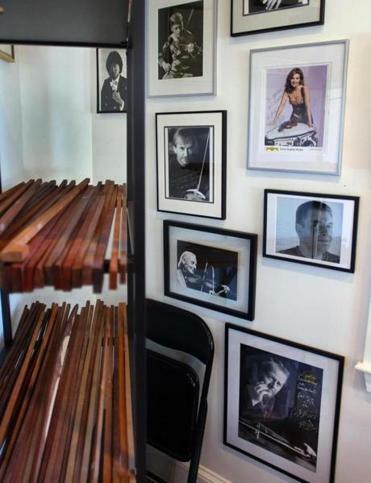 Benoit Rolland's home shop has photos of some of his famous clients. The wood that is used for the bows sits on the shelves. For Rolland, like many recipients, the call was startling, with no idea that he had been nominated for the honor. Rolland agrees with musicians who contend the bow is more important than the violin. 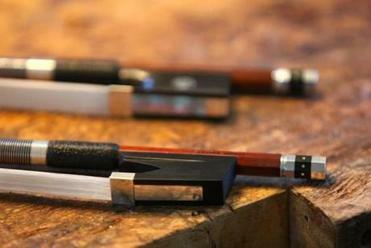 As his latest innovation, Rolland has devised a new kind of frog — the small piece on the bow, usually made from ebony, that allows the horsehair to be tightened. Rolland had been thinking about this problem with the traditional frog for many years. About five years ago, he began trying to develop a better piece. His first frog was too angled. He created 15 more versions, each one just slightly different, until he was satisfied. The final design will become available to musicians early this year. He also has other inventions underway, but declines to talk about them yet. Decades of making bows have taken a toll on Rolland: Five years ago, he had to stop playing the violin because his left hand was too stiff from his work. He could not bear the idea of not playing music, so he has returned to the piano. Kathleen Burge can be reached at kburge@globe.com. Follow her on Twitter @KathleenBurge.